Many fans of the AR-15 or other .223/5.56 platforms shoot a lot of rounds, and there's no better way to cut your costs than to reload. Start with the .223 brass casings here and check out our selection of components to build your own ammo. You'll want some small rifle primers for the .223, which can also be found on our site. .223 casings come from a wide variety of well regarded manufacturers; Top Brass offers good reconditioned cases, while Federal and Winchester offer quality new ones to load your own reliable ammunition a precise or as cheap as you'd like it. You’re not going through all the trouble of making your own cartridges just to wind up with an inferior end product. Like any reputable ammunition manufacturing company, you want to use only select components which, when put together by your expert hand, will yield a quality round that you’d stake your reputation for target shooting, hunting trip, or even your own safety on. 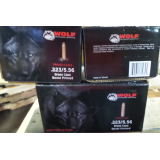 WOLF Ammunition is here for you. These 223 Rem cartridge casings are made of solid brass, so they’ll not only load once but several additional times for extended value. They have a uniform wall thickness and perfectly concentric necks, so they’re certain to load and fire true. These casings come preinstalled with non-corrosive Boxer primers, so all you’ll need more are bullets and powder and your afternoon loading session is well at hand. Don’t wait for your existing cartridge supply to run out before you start reloading -- order the components and start saving money today!